How an article might appear on Facebook's News Feed under new rankings announced Dec. 2, 2013. Facebook is retooling its ranking system to make some news articles appear more prominently at the expense of other content such as certain photos, the company announced Monday. No longer just a site for connecting with friends, Facebook lately has been showing off its digital newspaper ambitions. Just last week, for instance, it was revealed the company was testing a new feature to let users save article links to a list for later reading. And when Facebook redesigned its News Feed earlier this year, CEO Mark Zuckerberg said the company was trying to give its billion-plus users the "best personal newspaper they could find." The new rankings are designed to make high-quality content appear more prominently in Facebook's central News Feed, Facebook's engineers said in the company's announcement. How Facebook defines "high quality" is a little obscure, though it appears to be related to how often articles are clicked on on mobile devices and whether the link is for a news article versus a buzzy photo. "Starting soon, we'll be doing a better job of distinguishing between a high-quality article on a website versus a meme photo hosted somewhere other than Facebook when people click on those stories on mobile," the company said. As a result, users may start to notice more links to news articles in the News Feed, the company said, particularly on mobile devices, and fewer meme photos. Following the changes, Facebook will be emphasizing a certain type of content. 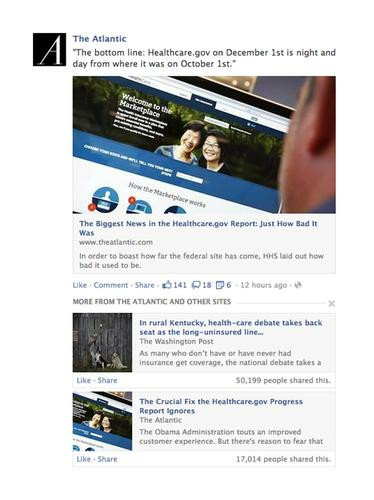 Stories devoted to the disastrous Healthcare.gov website from The Atlantic and The Washington Post were highlighted in Facebook's announcement. Additional articles related to the primary story may also appear after people click on the first link, Facebook said. The update is also meant to highlight articles generating the most chatter on Facebook. To do that, the company has updated its "bumping" system so that some stories with new comments will occasionally resurface in the News Feed. The new ranking capitalizes on the growing trend of people getting their news from Facebook and other social sites. Average referral traffic from Facebook to media sites tripled in the past year, the company reported on Monday. Some of Facebook's biggest competitors are growing more active in the business of news delivery. Twitter now has an experimental account called Event Parrot designed to keep users informed via direct message. Yahoo has hired TV news anchor Katie Couric to reinvigorate its original news programming, and Google News displays stories according to users' interests. For Facebook's new ranking system to succeed, however, the company must balance the more carefree way some people use the site with its more serious news ambitions. Apparently, the company sees an opportunity to provide news to its users and keep them there at the same time. "Today's update to News Feed ranking recognizes that people want to see more relevant news and what their friends have to say about it," the company said.